Rising house prices after 2002 prompted another capital cycle in the US homebuilding industry. By the time the US housing bubble peaked in 2006, the excess stock of new homes was roughly equal to five times the annual production required to satisfy demand from new household formation. Spain and Ireland, whose real estate markets had even more pronounced upswings, ended up with excess housing stocks equivalent to roughly 15 times the average annual supply of the pre-boom period. Whilst under way, housing booms are invariably justified by references to rosy demographic projections. In the case of Spain, it turned out that recent immigration had largely been a function of the property boom. After the bubble burst and the Spanish economy entered a depression, foreigners left the country by the hundreds of thousands. Several well-known “value” investors who ignored capital cycle dynamics were blindsided by the housing bust. In the years before US home prices peaked in 2006, homebuilders had grown their assets rapidly. After the bubble burst, these assets were written down. As a result, investors who bought US homebuilders’ stocks towards the end of the building boom when they were trading around book value – towards their historical lows – ended up with very heavy losses . From a capital cycle perspective, it’s interesting to note that although UK and Australia experienced similar house price “bubbles,” strict building regulations prevented a supply response. Largely as a consequence, both the British and Australian real estate markets recovered rapidly after the financial crisis . Typically, capital is attracted into high-return businesses and leaves when returns fall below the cost of capital. This process is not static, but cyclical – there is constant flux. The inflow of capital leads to new investment, which over time increases capacity in the sector and eventually pushes down returns. Conversely, when returns are low, capital exits and capacity is reduced; over time, then, profitability recovers. From the perspective of the wider economy, this cycle resembles Schumpeter’s process of “creative destruction” – as the function of the bust, which follows the boom, is to clear away the misallocation of capital that has occurred during the upswing. The key to the “capital cycle” approach – the term Marathon uses to describe its investment analysis – is to understand how changes in the amount of capital employed within an industry are likely to impact upon future returns. Or put another way, capital cycle analysis looks at how the competitive position of a company is affected by changes in the industry’s supply side. In his book, Competitive Advantage, Professor Michael Porter of the Harvard Business School writes that the “essence of formulating competitive strategy is relating a company to its environment.” Porter famously described the “five forces” which impact on a firm’s competitive advantage: the bargaining power of suppliers and of buyers, the threat of substitution, the degree of rivalry among existing firms and the threat of new entrants. Capital cycle analysis is really about how competitive advantage changes over time, viewed from an investor’s perspective. A man of affairs does not want to be bothered in the evening. A great many salesmen make the mistake of thinking that pestering a man is the same as selling him, and they get their prospects into such a state of exasperation that they would not buy a gold dollar from them at 50 percent off. Just getting to a man is not enough--it is when and how you get to him. There are more wrong times to sell a man than there are right times, and if I ever should write a book on salesmanship I should give about one third of the book to the topic "Common Sense." I have been buttonholed thousands of times by salesmen who, if they had just exercised a grain of common sense, would have known that, while the moment might be a very good one in which to make my acquaintance, it was no time at all to persuade me to buy anything. A good salesman will never intrude. In the first place, he will know that intruders do not make sales, and in the second place he will have brains enough to arrange for the right kind of a meeting with his prospect--no man likes to be panhandled, and some selling comes close to panhandling. The collection of old articles by James Montier posted the other day reminded me of another good collection of his work during 2008, HERE. We suspect that business leaders who are busy promoting themselves or their stock are not properly focused on running their companies. We go out of our way to look for management that cares about shareholder value but doesn't hype its stock. In this respect we admire Johann Rupert, the CEO of Richemont, the luxury products group, who advises against the corporate hard sell on the grounds that 'if you talk up the stock, when the price comes down, the folks come looking for you!' All too often, however, denial and a desire to 'spin' the most optimistic message gets the better of truth in meetings with shareholders. Bad news is rarely telegraphed in advance. One learns to apply a filter to all promotional noises and avoid those companies whose executives seem most talented in the art of spin. And in case anyone has missed it, the more recent set of Marathon letters is available in the book Capital Returns: Investing Through the Capital Cycle: A Money Manager's Reports 2002-15. Quote of the day, from Warren Buffett commenting in his 1990 letter on Berkshire's non-insurance operations [H/T @Sanjay__Bakshi]: "Our extraordinary returns flow from outstanding operating managers, not fortuitous industry economics." Interestingly, at the time of Warren Buffett's announcement in 2006, his net worth was also about $45 billion. And if the roughly 500,000 A shares he held at the time were priced at today's prices, that $45 billion would be worth over $100 billion, which would make him the world's richest person by more than $20 billion. Those claim checks that will be given back to society continue to compound. As a reminder around holiday shopping season, you can support this blog by shopping on Amazon through THIS LINK. If you choose not to use the link for this blog, consider using the link for one of your other favorite blogs....unless of course you are a major Amazon shareholder and want to save the company having to pay a small commission. But overall, it's a good way to support the bloggers of the world without directly using their sites' donation tabs and tip jars. The 4th edition, and 20th anniversary, of Lawrence Cunningham's The Essays of Warren Buffett is now available. Evaluating the likely success of a corporate turnaround is a notoriously difficult activity for investors. 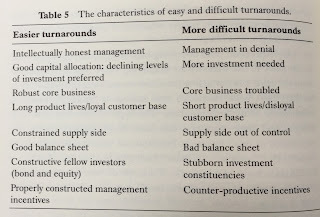 They need to distinguish between easy and difficult turnarounds. In almost every case, however, they must start by understanding how the firm got into trouble in the first place. Most troubled companies can only hope to recover once management open-mindedly appraises the situation -- when there is a mood of denial, turnarounds are unlikely. This explains why successful new starts are so often associated with fresh management, usually from outside the industry. In Table 5 we rank the factors to be considered when evaluating corporate turnarounds by importance. After the honesty with which management addresses the problem, we consider the second most important issue is the level of investment. A successful turnaround should not need large levels of new investment. After all, why risk throwing good money after bad? … There is no shortage of poorly performing companies that appear cheap on paper. But it’s how management allocates capital that determines the success or failure of any turnaround. … Firms with short product lives, such as speciality retailers and technology firms, face an uphill battle. Miss a fashion trend or a technology leap and it is very difficult to catch up. 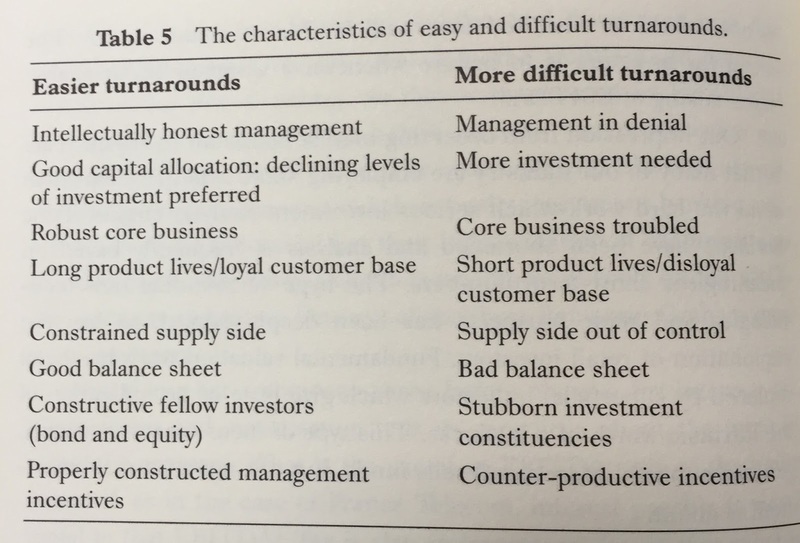 … To sum up, the three most favourable characteristics for identifying the probability of success in a corporate turnaround are: intellectually honest management, good capital allocation (preferably declining levels of investment) and a robust core business.